IA Mullin's debut fantasy novel Mystillion is available for purchase from your favorite retailers Amazon, Barnes & Noble and iBooks. 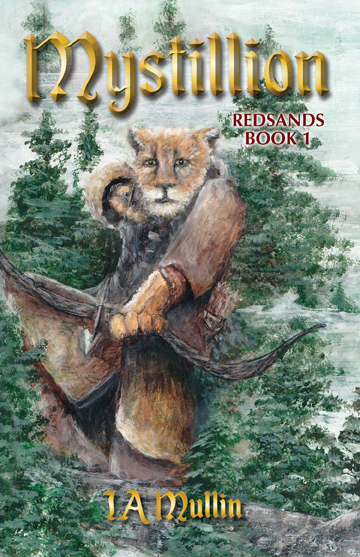 The exciting beginning of a journey through the Kingdom of Redsands. Could you decide to hunt outlaws to protect those who treat you like dirt? Would you choose to help someone who you knew was not who they claimed to be? Can you keep a secret with death lurking ever closer? Not only does Marilana make her choices with confidence, but she is still in her youth, not yet considered an adult. A young lioness, fiercely devoted to her path as a Bandit Hunter, a student, a servant, and a healer, Marilana lives a lonely life. With few friends and a desolate future, she is suspicious of the new lion in her class. When Marquiese forces his way into Marilana's path, lives change. Marquiese is living a lie. His life depends on his secret remaining hidden. When he lets his curiosity drive him close to Marilana, he risks everything. Is trusting her the biggest mistake of his life...or the only way he can survive? Come, enter Mystillion and the kingdom of the Redsands and let the journey of Marilana and Marquiese lead you to fantastic places. You may even learn a little about yourself along the way.